According to Maxwell’s equations, accelerated charges emit electromagnetic radiation. In particular, when an electron hits a material, it is subjected to a scattering by the coulomb field of an atomic nucleus, so it can be thought that it is “braked”. If the energy of the bombarding electrons is high enough, the emitted radiation lies in the X-ray region of the electromagnetic spectrum. Where is the number of atoms per volume unit, Z is the atomic number of the target material, is the fine structure constant and is the electron mass. It is therefore clear that the loss of energy is proportional to Z2 , to the energy of particle E and inversely proportional to the mass of the particle. 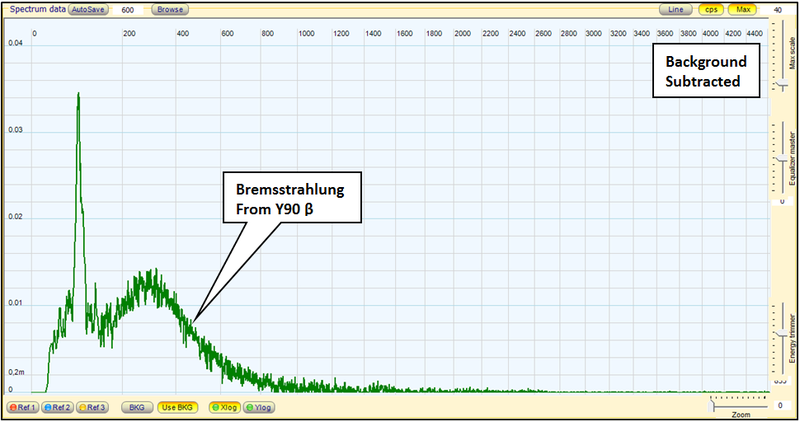 For particles heavier than the electron the bremsstrahlung radiation is negligible. The logarithmic term is due to the partial shielding of nuclear charge by atomic electrons. The formal treatment through quantum mechanics was carried out by Hans Bethe and Walther Heitler in 1934. 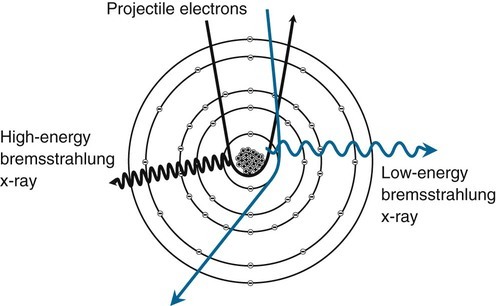 This continuous spectrum overlaps even single strong lines, as bombarding electrons can expel electrons from the most internal atomic shells of the target, and the rapid filling of these gaps by other electrons of the upper layers produces characteristic X-ray for each atom (called “X ray fluorescence”), As shown in the image to the side. Alternatively, the energy difference between the two orbits will result in the further expulsion of electrons. This phenomenon is the Auger effect. As electrons source we used 0,1 μCi of Strontium-90, which is a radioactive isotope of strontium produced by nuclear fission, with a half-life of 28.8 years. It undergoes β−decay into yttrium-90, with a decay energy of 0.546 MeV. 90Sr undergoes β− decay with a half-life of 28.79 years and a decay energy of 0.546 MeV distributed to an electron, an anti-neutrino, and the yttrium isotope 90Y, which in turn undergoes β− decay with half-life of 64 hours and decay energy 2.28 MeV distributed to an electron, an anti-neutrino, and 90Zr (zirconium), which is stable. Note that 90Sr/Y is almost a pure beta particle source. 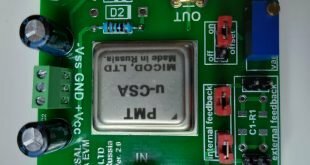 We have used a gamma detector with NaI(Tl) 63×63 mm crystal, put in a lead shielded measurement well. 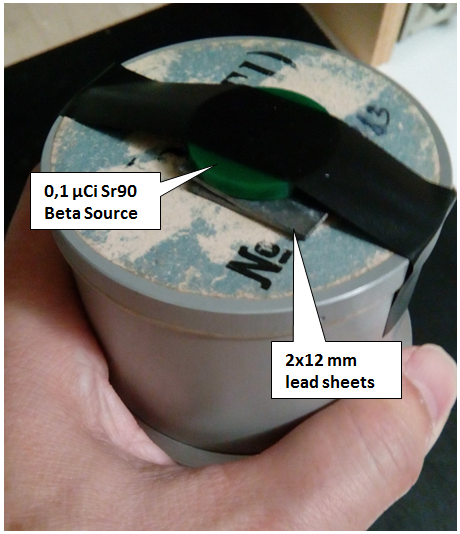 The Sr90 source has been put at the bottom and shielded with two 1,2 mm thick lead sheets, total thickness 2,4 mm. 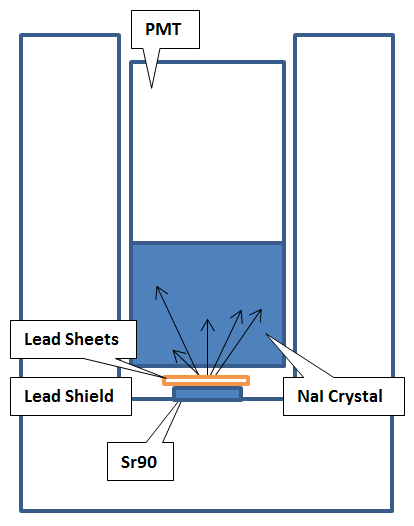 The two images below show the schematic of the apparatus and the source attached to the scintillator crystal along with the lead sheets. With the setup described above we did gamma spectrometry measurements on the bremsstrahlung radiation produced by the interaction of the electrons emitted from the source with the lead sheets. Due to the small activity of the source and the relatively low energy of the electrons it was necessary to prolong the measurement for several hours and to subtract the background spectrum in order to highlight the bremsstrahlung radiation. 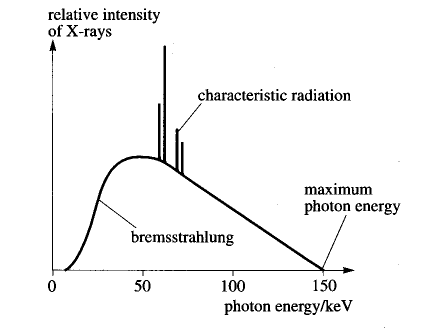 The background rate is around 41 CPS, while with the source in position the rate is 47 CPS : 6 CPS of bremsstrahlung radiation : a low but measurable value. 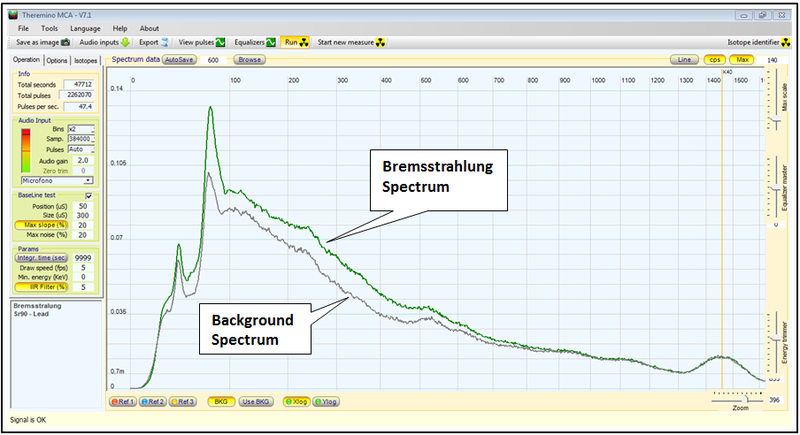 The figure below shows the radiation spectrum superimposed on the background spectrum. Both spectra have been acquired for several hours. 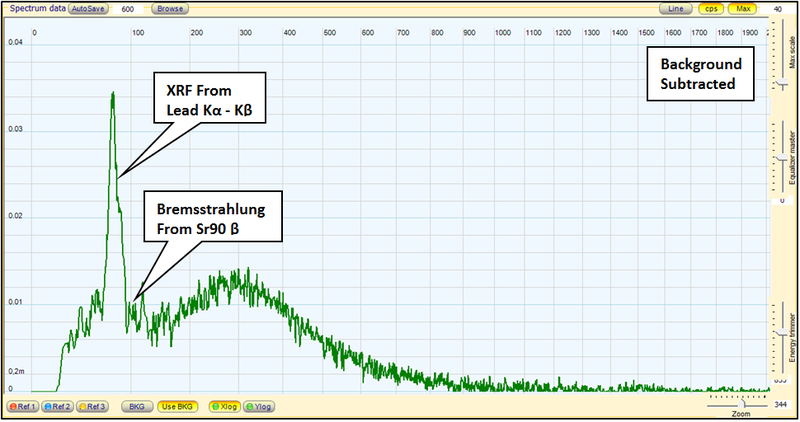 By subtracting the background spectrum, it is possible to obtain a good representation of the bremsstrahlung X / gamma spectrum. The graphs below show the spectrum that you get.